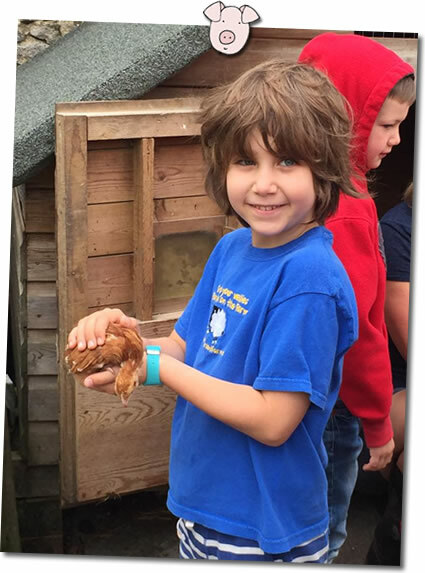 Family friendly farm holidays for you and your children in beautiful Cornwall! or kick off your wellies and head up to our indoor pool for a swim and relax in our jacuzzi. Family friendly farm holidays in sunny Cornwall! Higher Lank Farm has been shortlisted for the FreeFrom Hero Award 2019! We've been shortlisted for the FreeFrom Hero Award 2019! *We know their names, even when they first arrive. *We include every child when we feed the animals every morning no matter how young or their needs. *We only take a maximum of 5 families at a time so everyone’s special. *We welcome families with allergies and special diets, no matter how complicated. *We have all the facilities and equipment you need for twins and triplets. *You can arrive on Saturday from 12pm and have lunch, swim and play until your accommodation is ready. *We serve nursery teas and suppers that all of our guests can order if they wish. *We’ve a great endless pool, jacuzzi and sauna that you can book just for your family if you wish. *We babysit so you can have a romantic child free evening out..
or at the farm – a candlelit dinner in the grounds or an hour at ‘the Swim Shed‘ with the jacuzzi, pool and sauna exclusively for two. *We’ve our own private woodlands and stretch of the river for you to explore in peace. *You can enjoy a unique tractor and trailer ride to see our herd of cows followed by a fantastic homemade Cornish high tea. *We welcome families with children with ASD. Lucy is a former special needs teacher. *We have electric car charging facilities. *We’re unique in that we ONLY accept bookings from families with at least one child under 7 in the farmhouse and one child under 12 in our cottages. *We do not know of anyone else who does what we do! Family friendly farm holidays for you and your children. We are NOT a theme park or a holiday village, but a proper working farm and we would like to welcome you and your family to become part of our daily farming life. Whether self-catering in our luxurious farm cottages, or being cooked for in the main farmhouse, we have the perfect family friendly farm holiday for you and your children. On our working farm we specialise in meeting the needs of parents, children, babies and toddlers alike. Whatever the weather, whatever your needs, there is always heaps for your children to see and do both indoors and out. So much, that many of our guests report babies, toddlers, twins and triplets that don’t sleep at home, sleep soundly here all night and wake ready to play and help on the farm every morning of their stay! Friendly, relaxing and welcoming…… Let our family help your family have a fabulous time. You can now fly to stay with us from Glasgow, Belfast, Leeds, Stanstead, Gatwick airports, and now in 2019 there are flights from London Heathrow airport landing at Newquay airport too. It’s just 45 minutes drive from the farm-and car hire is easy and inexpensive too. Bo Peep cottage is having an outdoor playground makeover. A custom built play farm shop complete with it’s own garage, so you can drive to work! Gorgeous wall mounted Daisy chalkboards and new childrens’ seats too. Humpty Dumpty cottage isn’t missing out with a lounge makeover and new fridge freezer for it’s kitchen! We will be organising allergy friendly Easter Egg hunts on Sundays 31 March, 7 April, 14 and 21 April. All our Easter stays include our Welcome tractor and trailer high tea at no extra charge! And we’ve got a Trip Advisor Certificate of Excellence! Higher Lank Farm takes credit card payments by phone. Eco-friendly Higher Lank Farm actively supports low food miles, British produce, real nappies and recycling to reduce landfill waste and provides the perfect working farm holiday for families with babies, toddlers and young children, and especially with twins and triplets. We're so green, we have our own Biomass Boiler system (fuelled with locally sourced wood and from our own woodlands) which heats the farmhouse, the cottages and our indoor pool. We now have electric car charging facilities as well! 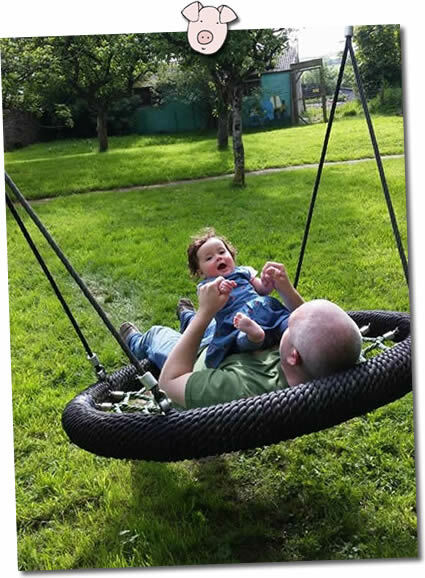 Toddler, baby and small child friendly farm holidays at Higher Lank Farm, Cornwall. The perfect holiday for families with small children.